Growing up, as an avid reader, a story that fascinated me was Jules Verne’s Around the World in Eighty Days. Perhaps it was the notion of being able to travel the entire world in a finite duration that caught my fancy back then. Naturally when I got a call recently saying a woman was attempting a trip around the world in 80 days, in a micro flight, my interest was piqued and I decided to meet the lady in question – Audrey Deepika Maben. Capt. Audrey Maben took to the skies as a young NCC Cadet at the age of 15. Having been exposed to gliding in her college days, she quickly realised that she was was good at it. After winning a national competition as the All India Best Girl Glider Pilot in 1993- 94, she decided to pursue gliding by enrolling into the IIT Kanpur Gliding Centre and soon obtained her first Glider Pilots License. “During school I actively participated in sports. I was always running around and I happen to be good at it! I played basketball extensively in Pre University and university, and participated in tournaments upto the national level with my basketball team. I guess I was always chasing an adventure and thrived with these experiences,” recollects Audrey. She then went on to obtain a Microlight Pilots License and set a national flying record by participating in the Air Race India 2003. 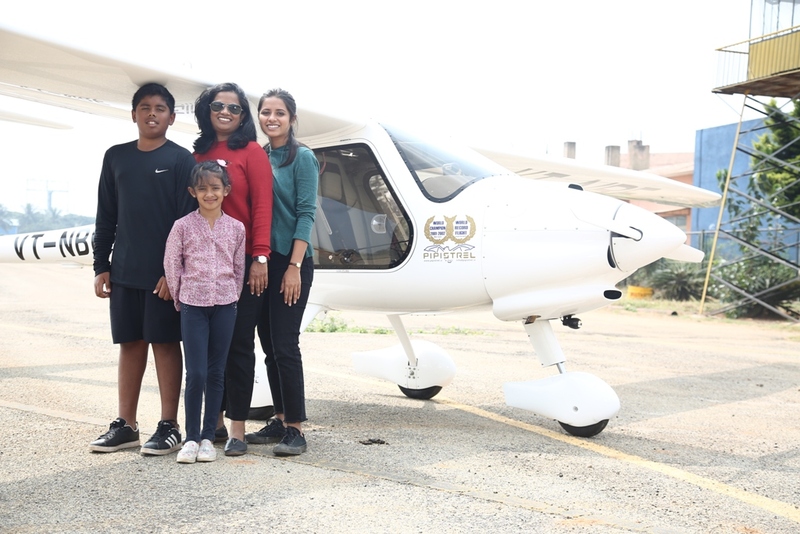 Besides being the only woman to fly as pilot-in-command during the race, she covered a distance of 2400 kms in five days from Bangalore to Nagpur and back again solo in a microlight; a feat established by The Aeroclub of India and listed in the Limca Book of Records. In 2007, Audrey went on to become the country’s first woman flight instructor. “I aspire to make many hobby pilots which will include as many women as men and show people young and old, a different perspective of the world we live in,” she explains. A student of Baldwin Girls High School and Jyoti Nivas College both in Bengaluru, Audrey set up ‘I Can,’ a school for alternative holistic education in 2008 in Mysore. An Educator and Aviator, she is passionate about flying and children. Her 19 year-old daughter Amy, 13 year old Son Jay, 7 year old daughter Ava and ex-husband Ashok are all aviators. “Besides I also educate my children in my own school “I Can”, an attitude that has to be developed in every child and parent,” says Audrey. She is now all set to add another feather to her over crowded cap by attempting a first of its kind 80 day world tour in her microlight plane with her older daughter Amy. Incidentally, this flight is part of a campaign, WE! Women Empower, which promotes the message of women empowerment through a crowd funding effort and supports the ‘WE! 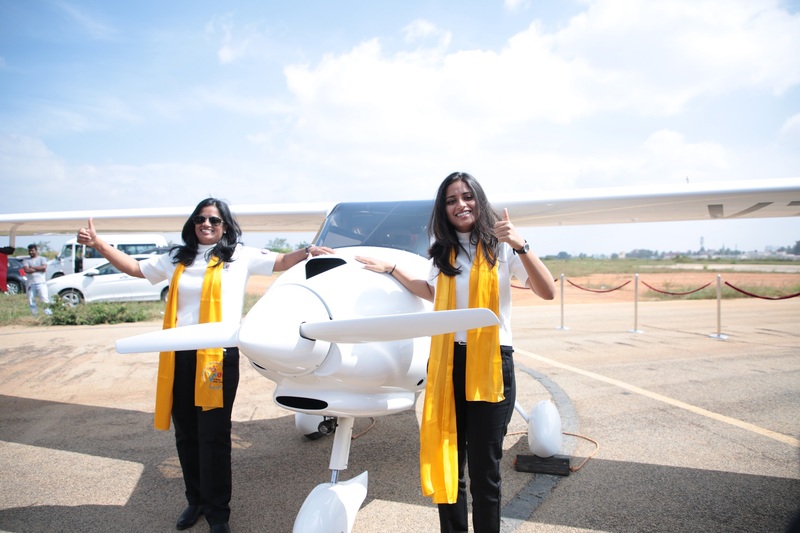 Udaan Scholarship’ which will help underprivileged Indian girls to fly. This is an initiative By, Of and For the Girls and Women of India by Social Access Communications in collaboration with the Union Ministry of Women and Child Development and Colours a private entertainment television channel. “This route was drafted out based on the wind and weather conditions through the course of our journey. We are likely to pick up more tail winds as we head east and cover the northern hemisphere. This would help us pick up speed and be an efficient way to conserve fuel,” says Audrey. Together the mother-daughter dup will attempt the enviable journey on February 18th next year and cover 5000km and 21 countries in 80 days. 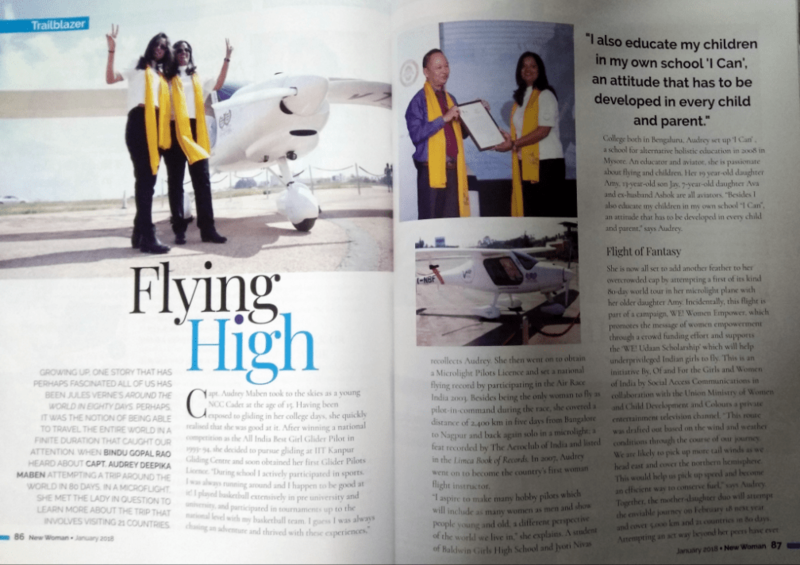 Attempting an act way beyond her peers have ever dreamt, Audrey says, “this mission was sketched out to propel women globally, especially in the aviation field. 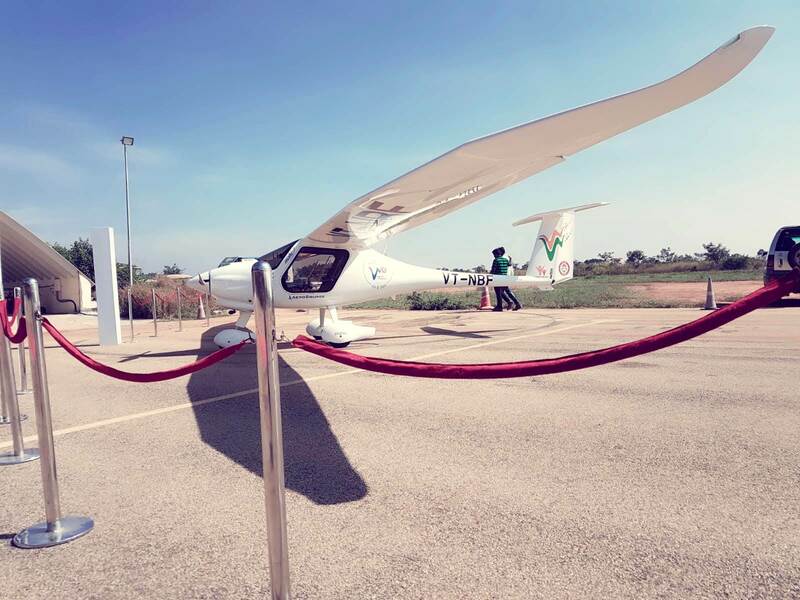 Social Access Communications approached me earlier this year and proposed that I attempt a circumnavigation on a micro light with women empowerment being the primary motive. It was never the agenda to attempt a circumnavigation in 80 days. The planning and preparation happened to result in a similar time frame.” Naturally she is excited as flying has spelt nothing but freedom for her. “It is pure joy to be airborne. Getting an opportunity to see the world and become one with it is an elevated state of freedom. This mission will give wings to many more girls like me who dreamt of flying every day. All dreams can come true. I have been blessed to live my dream,” she adds. As a person, Audrey is extremely positive and admits that she is “almost instinctively calm in a stressful situation. The ability to manage your emotions and remain calm under pressure helps me best deal with any given circumstance.” She made a conscious decision to become an Aerosports Professional, a rare choice for most who associate flying with Airliners or the Forces. Speaking of being a woman in a man’s field she adds, “in any given field women are subject to inequity. This has never obstructed my growth and performance as an aviator or an educator. I assert myself with the quality of my work and approach to my work environment.” In fact during an Air race in 2004, she dealt with extreme weather conditions and instrument malfunction during my flight from Bangalore to Nagpur. 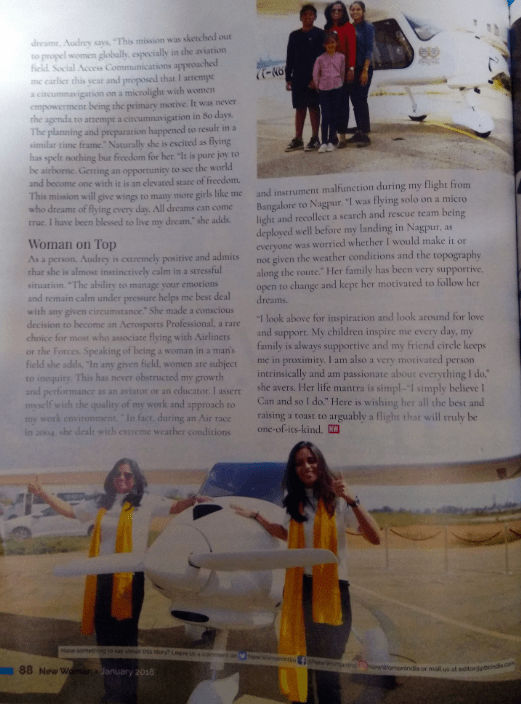 “I was flying solo on a micro light and recollect a search and rescue team being deployed well before my landing in Nagpur, as everyone was worried whether I would make it or not given the weather conditions and the topography along the route.” Her family has been very supportive, open to change and kept her motivated to follow her dreams. “I look above for inspiration and look around for love and support. My children inspire me every day, my family is always supportive and my friend circle keeps me in proximity. I am also very motivated person intrinsically and am passionate about everything I do,” she avers. Her life mantra is simple – “I simply believe I Can and so I do.” Here is wishing her all the best and raising a toast to arguably a flight that will be one of its kind.